Moscow Helicopter Plant named after ML Mil will build a new training helicopter gunship based on the Mi-28N Night Hunter ", RIA Novosti reported with reference to the statement made by the executive director of the factory Michael Korotkevich. Development will fund the company Rosvertol, which decided not to wait for funding from the Ministry of Defense. New MI-28UB will be created within the project on modernization of the Mi-28N. In addition venture Rosvertol, part of the holding company "Helicopters of Russia" plans by 2015 to double production of "Night Hunter". Told CEO Boris Slusar. According to him, now annually creates only 8-10 of these helicopters. Rosvertol expects to raise production to 20 cars a year. Double attack helicopter Mi-28N is designed to destroy various ground, air and surface targets. In particular, it can be used against enemy personnel and armor. "Night Hunter" is equipped with a built-gun, 30 millimeters, two outboard guns caliber 23 millimeter, as well as guided and unguided missiles. The helicopter can reach speeds of over 300 kilometers per hour and fly a distance of 450 kilometers (more than 1000 kilometers in the ferry option). Mi-28N is equipped with an airborne radio-electronic equipment with which the helicopter can carry out flights at night in adverse weather conditions at extremely low altitudes. So if that is the production schedule it looks like 100 Mi-28N by 2015, 200 by 2020, and 300 by 2025. Mi-28NE have a interesting mechanism to bail out of the chopper when in trouble. Nice vid... thanks for posting. Note that in the updated Mi-28MN they are talking about moving the gun ammo to an internal bin so more rounds can be loaded with less drag. Also that full dual flight controls were to be added so that the aircraft can be used as a trainer as well as a combat aircraft. 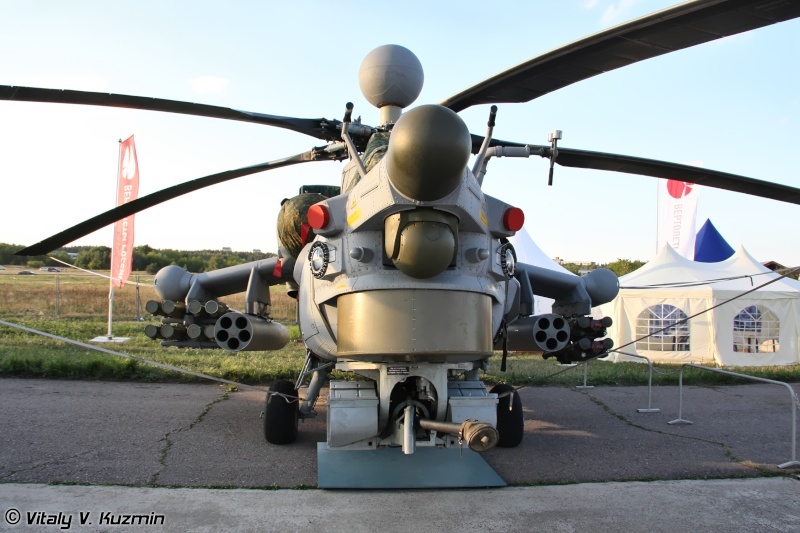 I would also point out the exhaust cooling system is rather interesting as on the Mi-24 with extra diffusion boxes the exhaust is directed up into the rotors to mix more readily with the air. In practise this worked but it also heated up the main rotors and made the aircraft much more visible in the IR range, so on the Havoc the engine exhaust is mixed with cooler air and directed downwards and away from the helo to make the aircraft less vulnerable to IR guided missiles. Garry never heard of Mi-28MN do you have more details or link ? -the gunner will now get flight controls the same as the pilots so the helo can be used as its own trainer aircraft and in an emergency if the pilot is injured or incapacitated the gunner can fly the aircraft. -Replacement of the TOR EO system with a new system from UOMZ with a gyro stabilisation system that will allow the use of the Krisantema missile which is replacing the ATAKA in service as a cheap ATGM... note the HERMES will also likely be part of its weapons suite too for longer range engagements. -has an error in describing the Krisantemas performance... its penetration is not 125mm or 4.9 inches of armour penetration... even the oldest model RPG-7 HEAT rocket can do better than that. 1250mm or 1.25m or almost 50 inches of armour penetration is the correct figure and it can be MMW radar guided or laser beam riding. The ATAKA is a relatively cheap weapon and Krisantema offers better performance without an expensive seeker so it makes sense to replace the ATAKA (800mm armour penetration is not really enough these days) with Krisantema on the ground and in the air. Edit: Just realised that this might mean the end of the thimble nose of the Mi-28... I wonder if they will consider putting a nose mounted MMW radar in place of the ATAKA/SHTURM transmitter, which would mean the rotor mounted radar could just hold the cm wave radar for aerial surveillance instead of both the CM and MMW radars. Garry , Thank You for that piece of information. Yes I already did that many times before its a great video indeed , Hope we could see similar video for Ka-52. It certainly is... thanks for posting. I remember watching the originally posted part two and noticing it was called pt2 and thinking about looking up the first part but never got around to it. Having it here is good. I wonder if the Havoc will normally carry HERMES missiles operationally, or if it will carry an air launched version of Chrisantema. 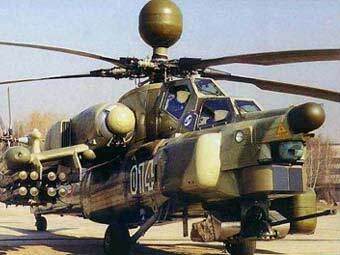 Certainly based on what has been released about the Mi-28M suggests that it will adopt the ground launched weapon as a standard missile. I should point out that the Chrisantema missile is MMW radar guided, but not like Hellfire or Brimstone. In many ways Hellfire and Brimstone are active radar homing missiles with their own MMW radar seekers so they are in practical terms fire and forget weapons like AMRAAM. Chrisantema on the other hand is more like a SARH missile like R-27 or SPARROW as it needs a radar equipped platform to mark the target from launch to impact. Now that is clearly not the same as ARH missiles and is certainly not fire and forget, however with a radar like that fitted to the Mi-28M it makes it possible that several targets could be illuminated at once for potential multi target capability. It also means that potentially the Chrisantema could be used against certain structures that are not distinct targets in MMW radar freqencies like bunkers etc because I would presume that the radar will be linked with the optical and IIR system so it could use a radar beam like a laser beam to mark targets to be hit that a standard MMW radar seeker in a missile could not lock on to. Of course even if it can't do that they can use the optical system to direct a low power laser at any target for the beam riding Chrisantema to fly down and hit. Remember also that if HERMES is carried it will use terminal homing too so the Havoc will have air to ground fire and forget capability. The secondary laser beam riding guidance capability also means that all versions of the system might not be fire and forget but can fire on two separate targets at once... though optical visibility is needed for the laser guided weapon it could be in the middle of a dust or snow storm for the radar guided missile and it wouldn't matter. The advantage of the Chrisanthema is that it will be much cheaper than HERMES and yet offer a flight range of 8kms and armour penetration figures of 1.25m of RHA and that it can be carried in large numbers like the ATAKA which it will replace. The Hermes has double the range, is more dual purpose with its near 30kg warhead, but will likely only fit 4 to a pylon so will be carried in half the numbers that Chrisantema could be carried in... which should match the similarly sized ATAKA with 8 per pylon. 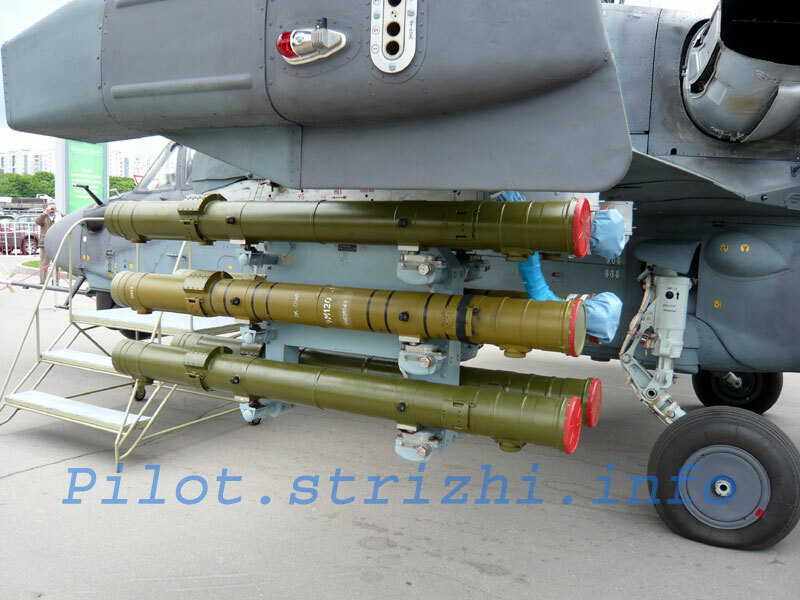 Those photos of the Ka-52 with pylons carrying 6 tubes for anti tank missiles might have been Chrisantema missiles being tested with the MMW radar fitted in the nose of the Ka-52. It would be a good cheap small missile for both aircraft and other helos in the fleet that have been upgraded with night optics like the Mi-8s. Now that I look at this photo I have posted myself I can clearly see it says 9M120 on the tube which identifies it as an ATAKA missile. No doubt however even if they plan to replace the ATAKA in service with Chrisantema the stocks of ATAKA are probably quite large as most of the Hind force used them plus they were standard weapons for the Ka-29 assault helix and for use in quad packs on some suitably fitted Mi-8s... they would have been bought in large numbers because they were cheap yet accurate and able to be used at up to 6km against all sorts of point targets. Likely ATAKA will continue in production for export as Chrisantema will require a MMW radar which export Hinds were not fitted for. I guess soon we will see a new Hind upgrade able to use laser beam riding missiles so it can fire Chrisantema. The Mi-28 N is equipped with millimeter wave radar N-025 Almaz-280 that operates in the Ka-band band and J band and is mounted on the main rotor, just like the radar of the AH-64 D Apache Longbow. The radar has a maximum range of detection of ground targets from 10 km for aerial targets N-025 Almaz-280 has a maximum range of detection of 20 km and for the monitoring function of weather phenomena is the range of 100 km.The maximum range for the designation of ground targets is 8 km. One of the criticisms levelled at the Mi-28N is that apart from wing tip pods it does not seem to have the normal self defence systems like IR and laser detectors. 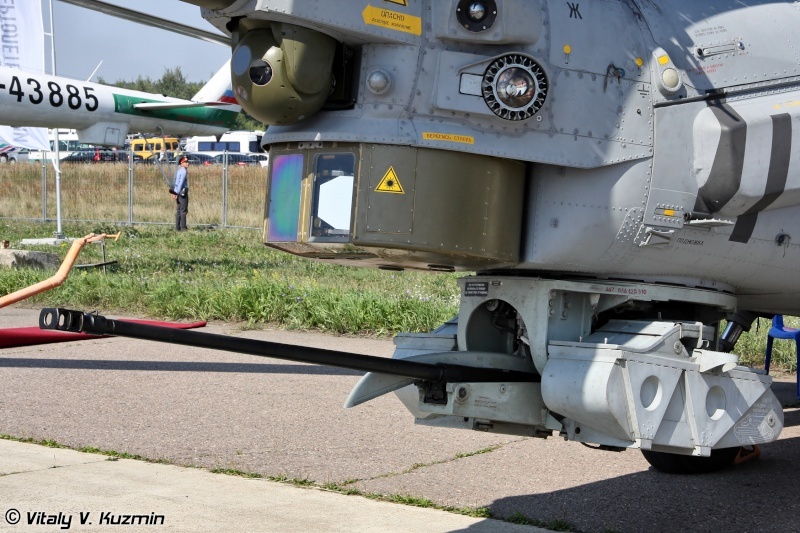 In recent photos small IR sensors have been added between the nose EO ball turret and the retractable lights mounted in the nose, but in the photos below of a gray Mi-28N intended for Indian trials for a new attack helo there is another sensor present above the new IR directional sensors that appear to be optical in nature and might be laser detection sensors. ...Was going to post the images here, but the image hosting feature doesn't seem to be working at the moment so go to the site above and scroll down to the Mi-28N photos and have a close look at the nice Gray Mi-28Ns and you will see some pictures. Note one picture has red covers over the new sensors in question while other shots they are uncovered and appear to have optical sensors which makes me suspect they are laser detectors. The laser warning stickers refer to the laser range finders in the EO ball and EO Drum under the nose BTW. Regarding Mi-28 numbers, according to A. Fomin in the latest Vzlet (Take Off) magazine, 40 Mi-28N have been handed over from the original contract for 67 helicopters. Apparently another 30 have been ordered and the current estimate is for 300 machines overall. A new batch of Mi-28N Night Hunter attack helicopters has been delivered to a pilot training center near Moscow, Defense Ministry spokesman Col. Vladimir Drik said on Wednesday. “The helicopters have been delivered to the Torzhok training center to improve the pilot training program there,” Drik said. The Mi-28N is the latest modification of the Mi-28 Havoc attack helicopter, manufactured by the Rostvertol plant in southern Russia. It has been designed to conduct hunter-killer missions against main battle tanks, helicopters, ground forces, and armor in any weather conditions. The deliveries of Mi-28Ns to the units in Russia’s North Caucasus and Central military districts started in 2009. A total of 24 Mi-28s were in service with the Russian Air Force as of February 2011. Two Mi-28Ns were lost in crashes during training flights in 2009 and 2011. Russia's Defense Ministry has said it is planning to procure between 45 and 67 Mi-28Ns in the next few years, and to fully replace the Mi-24 Hind helicopters with Mi-28Ns in the Armed Forces by 2015. 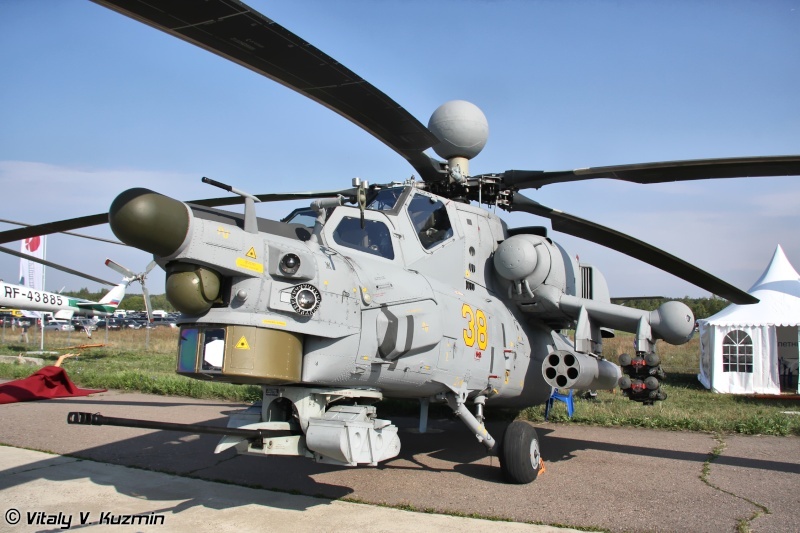 I have read they think the Mi-28NM will be in production in 2013 or 2014 (they knew, it is me that is unsure of the actual date), so I suspect they are working on the new redesign and will retrofit the upgrade to existing N models. Mi-28N Arbalet testing going well apparently. Also one of the pre-serials is being converted into the Mi-28UB right now. Good news, I hope Mi-28 will soon be equipped with radar, which will improve its capabilities.